[AUTO](Bind zone) Limit Break 4 (This ability is active if you have four or more damage):[Choose three of your «Tachikaze» rear-guards, and retire them] At the beginning of the close step of the battle that your grade 3 or greater «Tachikaze» vanguard attacked, if the attack did not hit during that battle, you may pay the cost. If you do, ride this card. 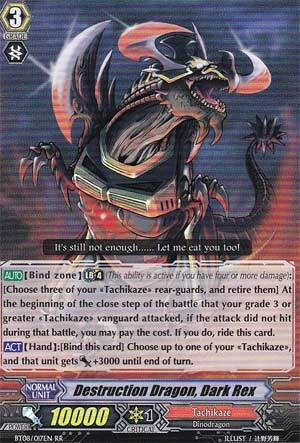 [ACT](Hand):[Bind this card] Choose up to one of your «Tachikaze», and that unit gets [Power]+3000 until end of turn. As a Tachikaze player myself, I love this card. It's kind of like having my own personal Spectral Duke Dragon if you really think about it. Granted, it doesn't seem as effective firsthand as its only at 10,000 versus Spectral's potential 11,000, but Dark Rex is made as both a setup and a punchline at the same time as both of its effects tie into one another. Let's start with how it starts: you bind him from your hand to give a Tachikaze unit +3,000 power. That's more than enough for an attack column to reach the next threshold of guarding if done correctly. A perfect example of this is if Megarex was being boosted by a Sonic Noah; normally, their combined power would be 18,000. It's a solid number, but still falls shy a few points against a 10,000 or 11,000 vanguard. With that said, you take into account Dark Rex's bind skill and add an extra 3,000 power to Megarex, and the column is a fierce 21,000 which is normally enough to push an extra 5,000 shield out of their hand, and personally, that's 5,000 less to worry about later on. As for his Limit Break, it's a bit of a hefty cost, but well worth it if done correctly. If your Vanguard attack fails and you're at Grade 3 or higher, then you can retire any 3 Tachikaze units to ride this card from the bind zone. It's a tricky move to really master, but can definitely force out a lot of a player's hand at the same time. The best way to utilize this is with Beamptero, Slashptero and Skyptero as they activate upon retirement and can either return to the hand of give extra power boosts to either your rear guards who haven't attacked or even to Dark Rex himself as he would already be in the Vanguard circle by the time those skills actually activate. The only glaring downside is that Dark Rex is at 10,000, which can easily be bullied against other vanguards given the right setup, but aside from that, this card fits the theme very well and can be a potential game ender!